Every Illinois gun shop has to be licensed by the federal government to be in business. But advocates and some state lawmakers say the fed is stretched too thin to stop the shady firearm sales they say can lead to gun violence. So, state licensing is now the law of the land. Illinois gun dealers will have to pay a license fee, set up video surveillance, and allow police to conduct regular inspections. They'll also have to show proof of customer FOID cards and IDs during those inspections. Gun shop employees will all have to be at least 21 years old to work there, and complete at least two hours of responsible business practices training each year. State Senator Don Harmon, a Democrat from Oak Park, sponsored the bill. He says it’s aimed at keeping gun dealers accountable, and preventing gun violence. Steven Stewart owns C.I. Shooting Sports, a shooting range and firearm store, in Normal. He says all of this will be nothing but a headache for him. Stewart characterizes his shop as "medium" in size, but he worries about owners of smaller shops, who watch their expenses carefully. Former Governor Bruce Rauner vetoed a similar measure last year, saying it would “do little to improve public safety”. 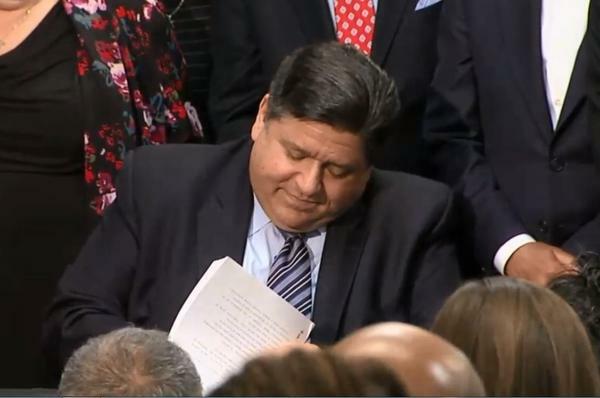 Democrats decided to hold this version of the measure for Pritzker, who had indicated he'd sign it after he was sworn into office. In doing so, Pritzker called gun rights groups who opposed the measure "wrong." "I’m going to continue to make sure that we’re standing up to the voices like the Illinois State Riffle Association and the National Riffle Association to protect our families and our children,” he said over applause. Monday marked the inauguration of Illinois’ new governor, J.B. Pritzker. He outlined his plans for his term before an energetic crowd that afternoon. On Tuesday’s St. Louis on the Air, Illinois Public Radio statehouse reporter Brian Mackey joined host Don Marsh to discuss the inauguration. Mackey, who recently spoke at length with Pritzker, highlighted key moments of the Democrat’s speech and touched on what’s ahead for the governor and the state.